On the way to the Up-Helly-A' Committee Dance in March 2007 Rae announced that the artist who was supposed to paint the bill head was not able to do it any longer. Rae's mum, Ann, jokingly responded that it was no problem, they would stitch one, as they were always stitching something or other. They all laughed, but the joke backfired after the idea grew on Rae and his wife, Leeza. Then they had to discuss the mammoth task of planning the design, creating a computer programme to transfer the design on to graph form and completing the whole venture before January 2010. Rae and Leeza created the design then Craig Robertson, Rae's cousin, had the daunting task of transferring the designs on to working graphs. Five months later the stitchers were presented with 84 A4 pages of the whole bill head in graph form, many yards of aida and an abundance of coloured threads. They took a photograph of Rae sewing in the first five stitches on 6th September 2007. It was then up to Leeza, Ann, Louise Jamieson and Lara Jamieson to complete this enormous task. There was an extra burst to get it ready in time for Rae to put in the last five stitches exactly two years after he had started. They used thousands of metres of thread, sewed 361,885 stitches and worked 2,448 hours to complete the bill head. 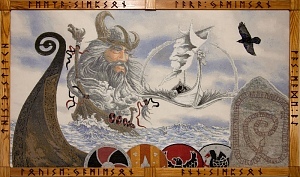 Rae then made the frame, cutting in runes naming the four stitchers. Sheila Hughson kindly spent many hours stretching the cross stitch onto the frame. Just when they thought they had finished Rae decided he wanted banners stitched too. These four war banners were inspired by the Bayeux tapestry and designed by Paul Johnston. Rae and Leeza then transferred his drawings, also depicting Rae's saga, into graph form. The banners were also stitched by Leeza,Ann, Louise and Lara. They were started in April 2009 and took an average of 166 hours to complete each one.